I hope everyone had a lovely Christmas! We enjoyed a simple few days of special traditions, including our annual lasagna Christmas Eve dinner at my parents' house, candlelight service, strawberry cheesecake, Christmas day at our house and my uncle's famous homemade peanut brittle. A big tin of it is my gift from him every single year and I always look forward to it. We ate entirely too much good food and stayed up way too late playing card games. It was cozy, simple and as stress free as it can possibly be with two little ones. We opted not to do many gifts this year and instead focused on teaching Olivia about giving to others and the experience of the season (cutting down & decorating our tree, making a gingerbread house, reading Christmas books, singing carols, etc.) as well as the reason we celebrate -- Jesus' birth. It was wonderful to have a small little celebration with those I love most dearly and I vowed to leave my tree up another week or two, since Olivia and I both love having it lit all day and night! 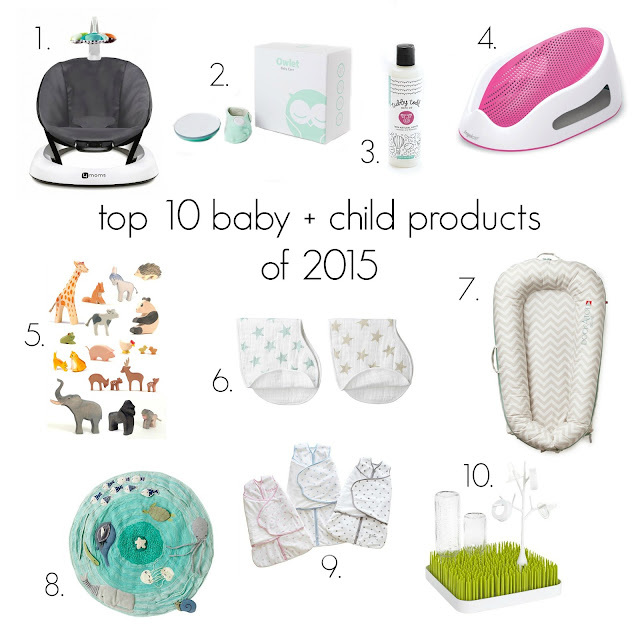 As 2015 comes to a close, I thought it would be fun to round up my favorite baby + child products from this past year. I stepped from the "toddler world" into having a new baby in September and have come across so many incredible new products for both of my girls, some of which weren't even around in 2013 when I had Olivia. A few of these have been long time favorites and others are ones I've discovered in the last three months since Penelope was born. They are the best of the best and staples in our everyday life with our girls. 4moms is one of our absolute favorite brands. From their mamaRoo, which Penelope loves, to their breeze playard and more, everything by 4moms is sleek, modern, well-designed with busy Moms in mind and most importantly, incredibly functional. One of their newest products, the bounceRoo is a lightweight, portable infant seat with 3 unique vibrations. I most often use it for Penelope in the bathroom when I'm giving Olivia a bath and need two free hands. I also place it in the kitchen while I'm cooking dinner. I love that I can easily move it from room to room (with one hand!) and always have a comfortable place to set her. It provides just the right amount of motion to comfort and settle her and takes up so little space, I can fit it just about anywhere. I love the overall look and Penelope loves batting at the toy on top. It was so easy to assemble and runs on batteries, making it cordless and something I don't ever trip over. It has come in so handy transitioning from one to two and my favorite part of all is that P is so happy when she's in it! I was introduced to the Owlet only weeks after Poppy was born and immediately fell in love with the concept; for those of you who haven't heard of it, the Owlet is the first baby monitor of its kind that can actually alert you if your baby stops breathing during sleep. It uses the technology of pulse oximetry and is incredibly user-friendly, plus the peace of mind it offers Dustin and I as parents is priceless. You can read my full review here and purchase your own an exclusive promotional price here. If there ever was a lotion so yummy that you basically could eat it and want to sneak it out of your child's room and use it for yourself, Tubby Todd's Lavender and Rosemary lotion is it. Oh my goodness, the first time I used it on Penelope after her bath I just about fainted. It's the most delicious scent without being overpowering and I put it on her all day long just so I can smell it! Even better is that it's made with all natural ingredients that are safe for the whole family, plus its super creamy and makes skin so soft. All four of us use it (yes, even my husband!) and we just love it. I always keep extra bottles on hand because it's just that good. This was a product I discovered during my first pregnancy and loved! Made to be used directly in a bathtub, the bath support is ideal for babies from newborn to 6 months. Designed for comfort and safety during bath time, the angel care support is a product I have relied on since bringing each of our girls home. A few features I love -- the mesh material allows water to drain easily and it dries quickly after use, it's ergonomically designed for baby's comfort with soft-touch material and contour shape, and it's super easy to store and even hang up; its lightweight and makes bathing your babe extra easy. It comes in blue and pink and is my go-to gift for new moms because of it's excellent price point. I shared all about my love for Ostheimer wooden toys a few months ago in this post and our feelings about them have only grown since then. In our living room -- the main place we spend our time during the day -- we have a rustic square coffee table with ample storage underneath. I have baskets and bins of Olivia's toys in it for easy access and day after day, week after week, the toys I find her playing with more than any other are her Ostheimer figures. We have the forest & farm sets but there are so so many darling ones! They are beautifully handcrafted in Germany with incredible attention to detail and overall design. I love that they're wood -- sturdy, well made and so pretty that I don't mind when they're left laying out. For Olivia's 3rd birthday in May, more of these are at the top of her list! She just loves them. This product was one of my husband's top picks and to be honest, we love everything from A&A. These bibs are perfect for keeping baby clean and dry during burping, bottle-feeding, eating & more. They are made of the softest muslin fabric which seriously gets softer with every wash. We still have sets from when Olivia was a baby that look brand new, and I love that they snap instead of velcro. It doubles as a no-slip burp cloth because of its contoured shape to fit on your shoulder and is ultra-breathable. Plus the patterns can't be beat. I recently added this one to our collection and just love it! Another new product I came across shortly after Penelope was born, the DockATot is absolutely amazing. Created in Sweden, the DockATot is a multi-functional lounging, playing, resting and snuggling dock for your babe -- perfect for at home or on the go. We seriously use ours every single day, and I loved being able to pack it up and bring to my parents' house on Christmas Eve so Poppy could take her afternoon nap away from home. It can be used for co-sleeping, changing, tummy time, and more. Plus it has a built-in handle making it extra easy to carry from room to room as you follow chase your toddler. You can read my full review here, but if you are looking for an incredible innovative product for your little one, the DockATot is it. It comes in two sizes -- the Deluxe (for babies newborn-8 months) & the Grand (for babies and children 9-36 months). Entirely for fun, this playmat was one of Penelope's Christmas gifts and I just love how sweet it is. So many playmats on the market these days are bright, plastic, loud, noise-making products and I love how simple and fresh this playmat is. It's full of fun sensory activities for babies and is super cushioned so it's comfy for baby to lay on. Penelope has enjoyed many hours on it since we gave it to her and I love that I can leave it out because it's a piece of art in and of itself. We were introduced to these when Olivia was born and they are a nighttime staple around here to keep Penelope sleeping safely, securely and peacefully. While I love traditional swaddling blankets, I find that they aren't secure enough for long periods of sleep because even when swaddled tightly, they can be busted out of. I love these swaddle sleep sacks because they are safe, comfortable and stay put, plus are designed to swaddle arms in or out. We swaddled both the girls from Day 1 on and these are gold. The swaddling sleep sacks are made for up to 6 months (or until your baby shows signs of rolling), and after that you can use traditional sleep sacks by Halo. They come in all sorts of fabrics, including muslin and chamois. They keep Poppy warm and toasty, comforted because of their swaddle feature and safe during nighttime sleep. PS They also have this style which allows for quick diaper changes without unswaddling. Ahhh-mazing. Last but not least, a fun and inexpensive product that makes life so much easier. The Boon Grass Drying rack is a modern and fresh take on drying racks -- made to hold all baby's accessories, including bottles and sippy cups, utensils, pump supplies and more. It's perfect for the countertop, comes in multiple sizes and has the cutest accessories. I love that the water drains into the lower tray and I can empty and wash it easily. Another fun gift for new Moms and something that I've grown so used to using, I don't think I could live without!